Step away from synthetic materials and introduce yourself to wool insulation. 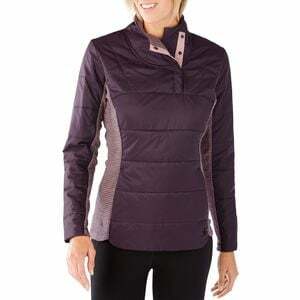 Smartwool's Double Propulsion 60 Insulated Pullover Jacket is the new midlayer that you need to try. Lightweight insulation will keep you warm in cold conditions with it's thermoregulation and has the ability to retain warmth even when its wet, just like a sheep. The wind-resistant polyester material and DWR treatment is going to give you the extra protection you need when worn as a stand alone piece. And the baselayer-material side panels gives you breathability on the underarms. Throw this on Saturday morning and lead the flock.